On November 30, 2018, ISDP welcomed Professor Jae-Seung Lee, Jean Monnet Chair in the Division of International Studies and Director of Nordic-Benelux Center at Korea University, for a forum discussion titled “Peacebuilding on the Korean Peninsula and the Role of the EU”. 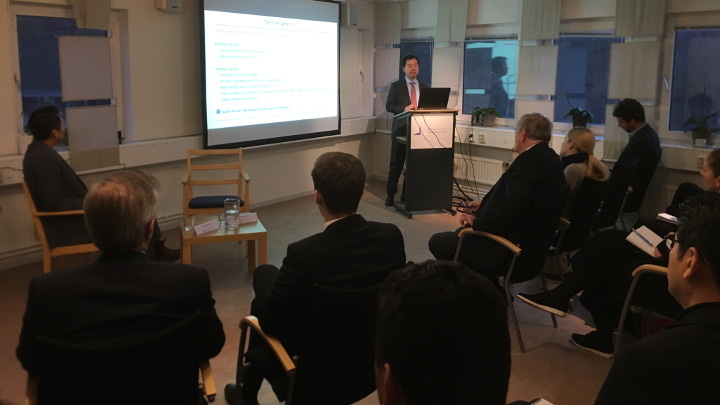 Professor Lee discussed about the contrasting views of the ongoing developments and the current challenges key stakeholders face on the Korean Peninsula, and the potential role of the EU in peacebuilding efforts. Professor Lee discussed factors, both external (international sanctions and the U.S. military threat) and internal (strategic and tactical changes in nuclear development) as well as South Korea’s role as a mediator and broker of dialogues that may have contributed to North Korea’s willingness for a renewed dialogue with the international community. He maintained that there are three co-existing perspectives on whether North Korea is sincere this time: i) yes, North Korea should be given an early reward through lifting the sanctions; ii) maybe, but tangible measures should be made before lifting the sanctions; and iii) no, only sanctions will bring North Korea toward denuclearization. However, due to the different interpretation of key concepts – e.g. end of the war declaration, peace agreement, and the denuclearization of the Korean Peninsula – key players have different priorities and the compensation scheme for denuclearization measures will differ. China and Russia prioritize regional stability, the U.S demands full denuclearization, and South Korea desires improved inter-Korean relations. The EU’s engagement with North Korea has been witnessed through the KEDO process in the 1990s and the establishment of diplomatic ties with several EU member states. However, in 2009, the EU adopted UN sanctions against North Korea while strengthening their engagement with South Korea. Long-term engagement on the Korean Peninsula can only be sustainable through a concrete multilateral scheme of consistent peacebuilding – the EU can contribute to this process with its norm-based diplomacy. Yet, the challenge remains within the EU and whether there is enough incentive for EU member states to get involved. Professor Lee suggested a new dialogue process on peace-building between Northern Europe and East Asian countries in order to exchange networks, knowledge and information. Moreover, a “non-political” agenda can sometimes be more effective than a “political” agenda when factors such as human security, economic transition and sustainability are maintained through multilateral ties which may lead to a positive incentive for EU member states to engage on the Peninsula. The lecture was followed by a discussion, moderated by Dr. Sangsoo Lee, Head of the ISDP Korea Center: what is the shift in North Korea’s negotiating position and how have priorities changed now that North Korea is demanding sanction lifting? The lecture concluded with a Q&A session with the audience and covered topics such as the level of readiness between North and South Korea regarding a unification; multilateral talks between key stakeholders and the EU as a talking partner; and the next minor breakthrough that may sustain the international engagement in the denuclearization process. ISDP thanks Professor Jae-Sung Lee and the members of the audience for participating in the discussion. Watch the video from the forum here or below.